After college I took some time for a backpacking trip in Europe. I was going to drown myself in culture – food, museums, theater, history, architecture, and everything else Rick Steves insisted I shouldn’t miss. I probably spent more time planning the trip than experiencing the trip. I was showing a friend my plans, and he said something that really challenged my view of Dallas, “You realize you can do all these things in Dallas, right?” Here I was getting ready to go half-way around the world to see many things I had never taken time to see in my own city. Theater is a great example and one I give to people when trying to illustrate the qualities of Dallas. Did you know there are close to thirty theater companies in Dallas? Most people are familiar with the Dallas Theater Center. Founded in 1954, it is the oldest continuously running theater in Dallas. 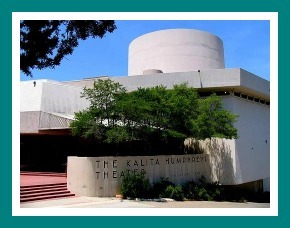 The company’s former official home, the Kalita Humphreys Theater, is a national landmark, designed by famous American architect Frank Lloyd Wright. Today, Dallas Theater is a resident company at the AT&T Performing Arts Center, with mainstage productions at the Wyly Theatre. Pocket Sandwich Theater is one of the most fun theater experiences around. The theater was founded in 1980 in a sandwich shop on Greenville and to this day serves sandwiches before the show. But the real attraction is the melodramas. You can look up the definition of melodrama but you will never really appreciate until you go. The audience is encouraged to boo, hiss, and throw popcorn at the villains. And when the heroes display acts of courage, the audience gives cheers of “hiza.” It is theater that doesn’t take itself too seriously. It’s just great fun. Nouveau 47 Theatre in the Magnolia Lounge is another great gem. It is located inside Fair Park and was built for the 1937 World’s Fair as an example of European Modernism. It’s an older and smaller theater. The plays don’t have the budget that other theaters have, but Nouveau 47 is dedicated to “staging new plays and relevant re-imagined adaptations of well-known plays.” Most of the plays performed at Nouveau 47 are written by people right here in Dallas. With almost thirty theater companies in DFW, there is literally something for everyone. Each theater has its own character, style, budget, and price point. The experience at each is completely different. So the next time you are trying to decide on something fun, don’t go see a movie. Go see live theater. The experience is much more stimulating. And you will be making a contribution to local theater. Special thanks to contributing blogger Jason Bunnell from Red Flying Horse. Learn more about Dallas at redflyinghorse.com.